Goosebumps at the library « "TeresaBruceBooks"
Now that the film fest is over, I’m back to focusing on the Byrne Miller book and spent a great day at the Beaufort County Library identifying photos to possibly use. Byrne’s estate donated all of her papers (and luckily for me her stash of publicity photos) to the District Collection under the expert care of Grace Cordial. I thought I’d seen them all but today I literally got goosebumps when she pulled out a photograph of Byrne’s mother: a Jewish immigrant from Russia named Fanny Meyer. I’d heard so many stories about this towering mother figure from Byrne herself — how Fanny went out and got a job at the Home Relief Bureau when all the men in the Miller family lost their jobs in the Depression, and how she looked the other way when Byrne became a burlesque dancer to bring in the family’s second paycheck. Fanny is a fierce character in the book — the woman who made Byrne take ballet lessons as a gangly teenager and the woman who told her to quit the Vaudeville circuit when her new husband Duncan became so depressed he stopped eating. I even have a seed pearl necklace that belonged to Fanny, given to me by Byrne. But somehow seeing the photos of Fanny — in an 1800’s formal group portrait and in a damaged but sweet snapshot on a country road — made Fanny so much more real to me. Imagine the strength of the woman who raised a woman as strong as Byrne Miller! The photos Grace Cordial helped me find today also include some early images of the Byrne Miller Dance Theatre back in the days when it was a performing group doing her own original choreography. 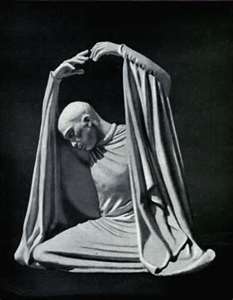 I got goosebumps all over again because I recognized, in a cast photo against a velvet stage curtain, the influence of the first modern dancer Byrne ever saw: Harald Kreutzberg. I can’t share the photos with you yet (we’re still working on permissions) but the costumes Byrne created for her Beaufort dancers are clearly inspired by the stark German modernism of her idol. Just wait til the book comes out! Is fame a worthy goal? Teresa, I can’t wait to read your book. I know it’s gong to be fabulous! I love things written that were gleaned from looking into photographs & beyond. Can’t wait to read it. Teresa, this first chapter is so evocative of Byrne. I eagerly await the chapters to come about the remarkable woman Duncan lovingly called his “monster”.